There's nothing more wonderful than sunshine and gorgeous flowers to celebrate a birthday. There's a quiet elegance about this birthday card that makes it the perfect choice for anyone in your life. Wishing the recipient a spectacular year will surely make them smile, while the clear skies are bound to have them daydreaming. What could be more wonderful?! For that special someone in your life celebrating their birthday, this sweet birthday card is the key to their heart. Everything about it is simply lovely. Just look at those gorgeous flowers in purple and yellow. The faded background adds a soft elegance, too. We can't forget the sweet sentiment of the verbiage! Tears are bound to happen! The sentiment of this birthday greeting card is made even more special by the soft, delicate floral details that surround it. Its message is simple but impactful; a reminder to someone you love-whether a dear friend, relative or significant other-that their beauty is something to be celebrated and cherished each and every day, but especially on their birthday. Tired of all those boring, stuffy flower birthday cards?! We’ve taken flower cards to the next level with this gem. The bright reds and yellows and pinks take this masterpiece to the next level and add an element of fun. The abstract background and sweet words only elevate this card even more, making it a great choice for a blend of fun and floral. How gorgeous are these tulips?! This is a great birthday card choice for anyone in your life, but especially the flower lovers. After all, the flowers are breathtaking, the yellow and purple colors create a unique contrast, and the sentiment is sweet. If you’re look-ing for a blend of fun and elegance, look no further than this card! With an image graceful and elegant, and wishes sincere, there is no better birthday card for the adventurer you hold dear! Don't just offer a happy day, but a whole thrilling new year for a new them! If there is any time that a person needs the love and support of their circle, it is in the face of new, fun challenges! And the best way to send that support is with the New Adventures Happy Birthday Card! Nothing says "Happy Birthday" and "I love you" better than a bouquet of roses. Pink roses mean love, gratitude, and appreciation, so there's no better way to tell your sweetheart how much you love her than with the flowers on this Happy Birthday card! 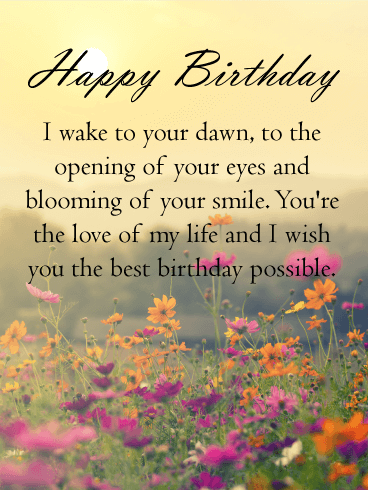 Your loved one is the most incredible and beautiful person you know, so help her have an amazing day with this card! This is the perfect birthday card for anyone you care about. The message of today being their special day is heartfelt and exciting without being too sappy, and the gold coloring is a unique touch. Flowers are never a bad idea, either. The bright colors of this card and the sweet, simple message make it a can't-miss for anyone special. What's not to love about this birthday card?! The colors are absolutely breathtaking. In the background, you have a stunning sunset, complete with the gorgeous sun's rays. The beautiful lilac flowers truly make this card stand out from the rest. If you're looking to wish someone a spectacular year with an equally spectacular birthday card, this is the one for you! A soothing purple sunset creates the most serene setting for this sentimental birthday card. Rows of rich purple flowers gently blow in the wind, as the heartfelt message helps capture that same mood. 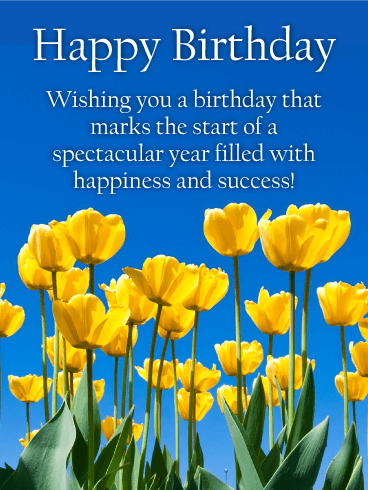 This is a beautiful birthday card to send to close friends & family members, whether you're celebrating together or sending your best wishes from miles away. If you need a birthday card to send to your mother or grandmother on her birthday, you have found the perfect Happy Birthday card! This card features watercolor art on a white background. Red, purple, yellow, and pink flowers surround a large blotch of pink in the center. 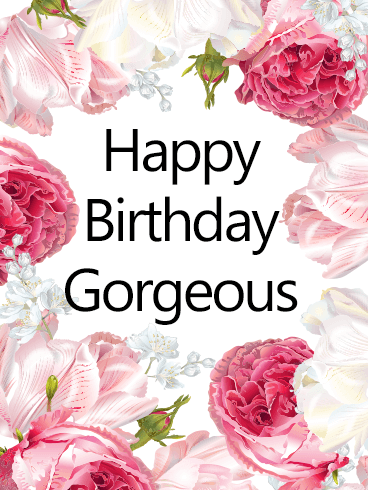 Use this birthday card to give your loved one birthday wishes as beautiful as she is! There’s no better way to wish someone a happy birthday than with a stunning bou-quet—a bouquet birthday card, that is! This card is stunning, with a simple yet fun bundle of flowers taking center stage. The yellows and purples and whites complement each other perfectly, and the sweet sentiment of wishing the recipient a wonderful day makes this a perfect choice. If you’re bummed that a gorgeous bouquet of wild and exotic flowers is out of your budget, don’t fret! We’ve got the next best thing: a stunning card with the perfect bou-quet for anyone’s special day. 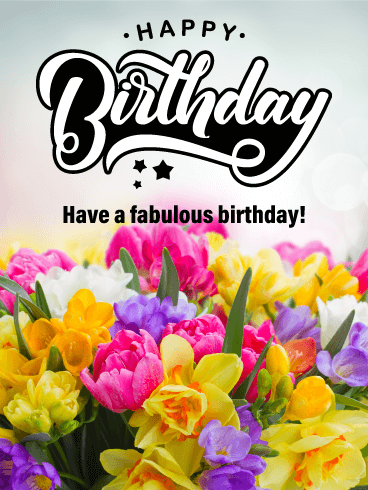 The script font in which “Happy Birthday” is written adds to the style and sophistication, tying the whole thing together effortlessly. 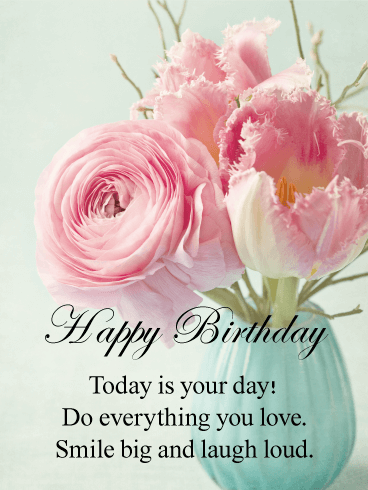 This birthday card is the perfect choice when looking for something simple yet beauti-ful and heartfelt. The single flower really catches the eye, while wishing the recipient is an amazing day is a great way to make them smile and let them know that you care. The watercolor style of this card really helps it stand apart and makes it a great choice. No well wishes are better thought out, nor better deserved than to hope they have a day as wonderful as they are to the world. Because those that spread cheer and joy, day or night, need to know that their efforts to do as such are appreciated. 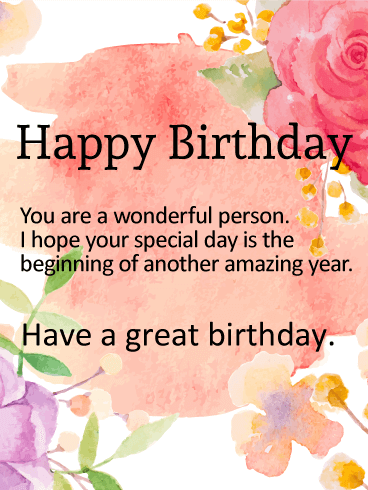 There is no better time to let them know, than on their birthday, and no better way than by sending this Lovely and Delightful birthday card. For that special soul that brings so much joy and beauty to all who have the pleasure of being around them, this card wishes that joy and beauty right back onto the recipient! The background is charmingly rustic with a flawlessly arranged floral bouquet in a sweet pitcher style vase. 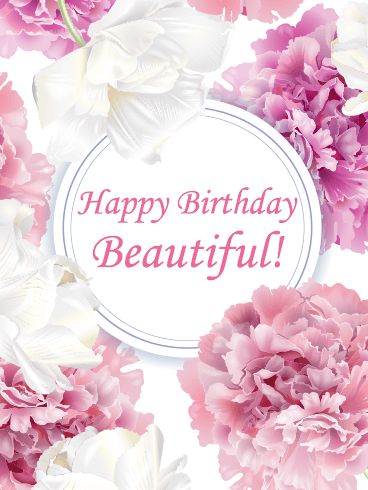 Keep the joy and beauty flowing by sending this happy birthday card today! Joyful tulips bloom and grow from a light blue flower box on the cover of this birthday card! They're so vibrant you can practically smell their intoxicatingly fresh scent! Deep purple, bright yellow, and red blush, no one can look at these flowers and feel sad! 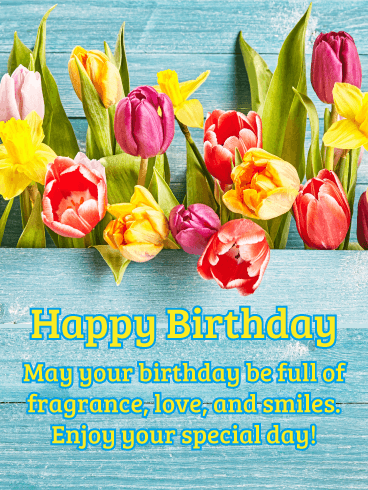 Wish someone a day full of fragrance, love and smiles by sending this happy birthday card for their big day! Cheerful thoughts, friendship, sunshine, yellow tulips. 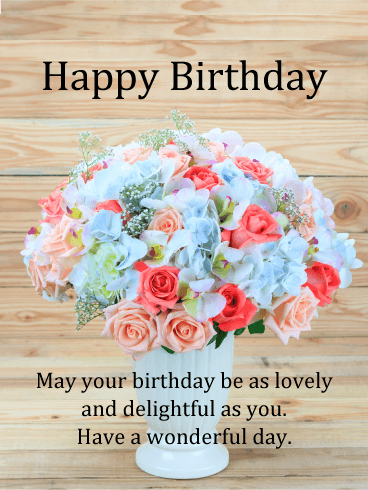 Brighten a special someone's birthday with this simply elegant happy birthday card. 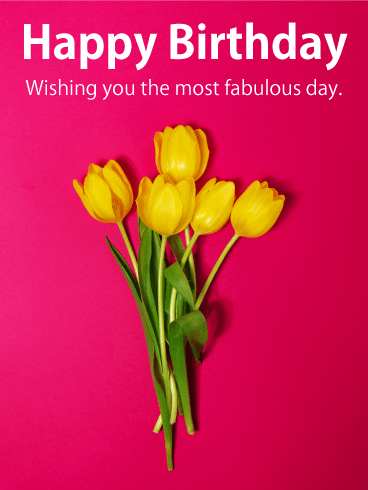 The birthday card itself is a fierce fuchsia shade which really makes the buttery yellow of each of those five tulips POP! Wish someone a fabulous day by sending them these flowers that are guaranteed to never wilt- even if they forget to water them! This birthday card has tons of elements that come together to make it simply fabulous. For starters, look at that rocking birthday font. It's tons of fun and screams that it's time to celebrate! 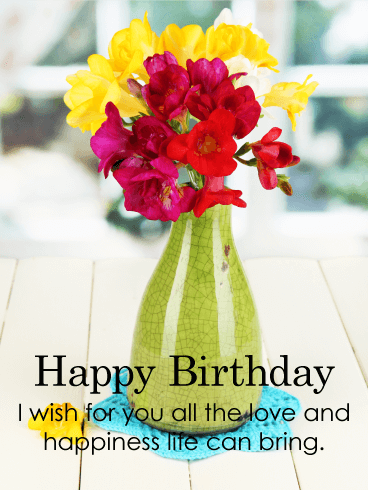 The bright flowers along the bottom are eye-catching and gorgeous, while the sentiment of wishing your loved one a fabulous birthday is, of course, sweet as can be! 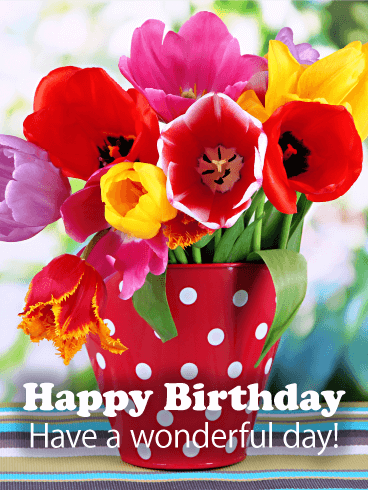 Hip Hip Hooray, what can I say, have a Happy Birthday with this Tulip Bouquet! 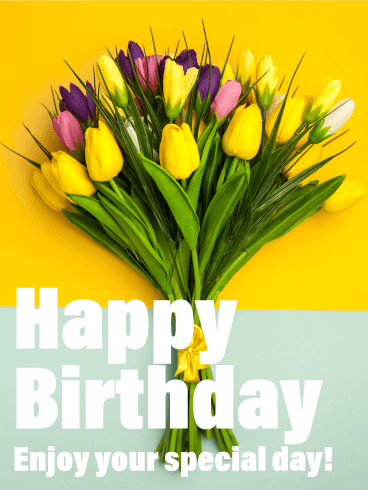 This birthday card features fresh picked tulips in canary yellow, vibrant violet, powder pink, and crisp white, all wrapped up in a golden ribbon on a two-tone goldenrod and powder blue background. 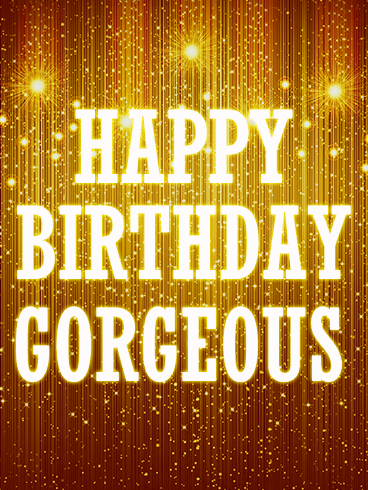 Make absolutely anyone's birthday instantly more fulfilling, by sending this message of beauty for their special day. Sometimes simply saying happy birthday isn't enough. 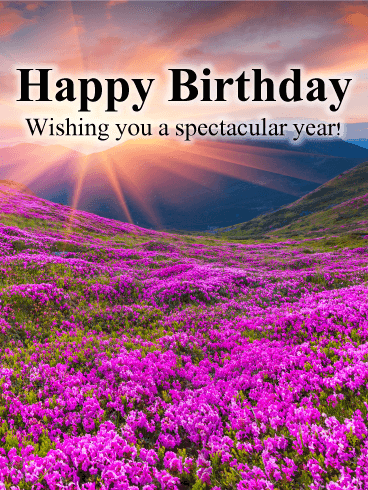 Let that special someone know you are taking a moment today to appreciate them and their amazing life by sending them this gorgeous birthday card. 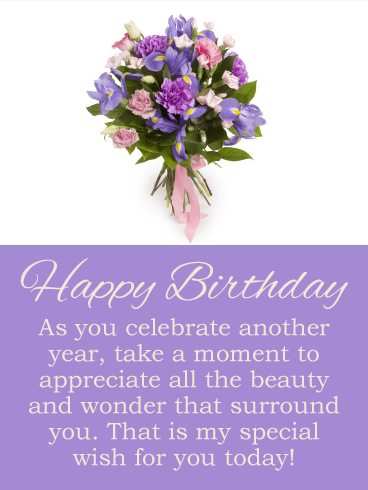 They will undoubtedly be feeling the love when they read this special birthday wish presented on a lovely lilac background decorated with a beautiful bouquet of fresh flowers! Who doesn't enjoy receiving the gift of flowers on their wonderful day? Thanks to this fresh from the garden card you don't even need a green thumb or to pick out a nice vase! 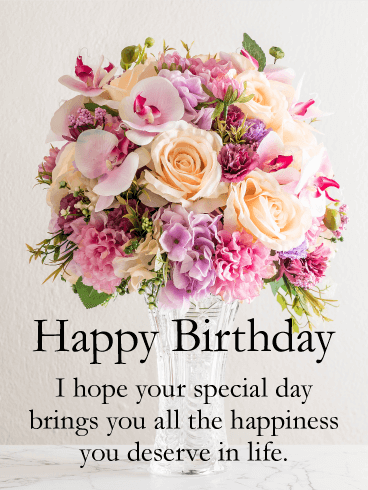 Choose this tastefully arranged flower bouquet birthday card to send to your floral loving friend, guaranteed never to wilt! 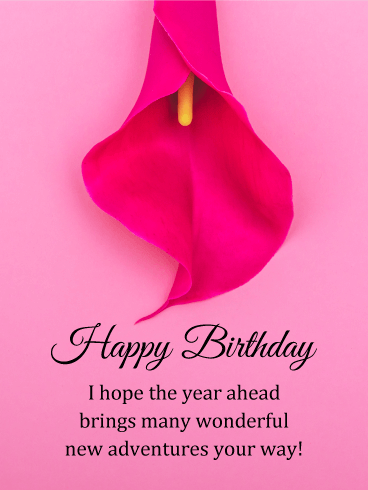 The pleasant pink background combined with a heartfelt wish is sure to make them feel loved. What does every woman want to receive on her special day? A beautiful bouquet of flowers! Flowers are a gift that reflects the beauty and rarity of the person who receives them. 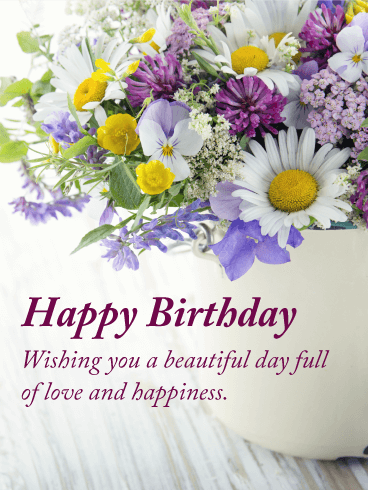 On your loved one's special day, use the gorgeous flowers on this Happy Birthday card to show her how much you love her. 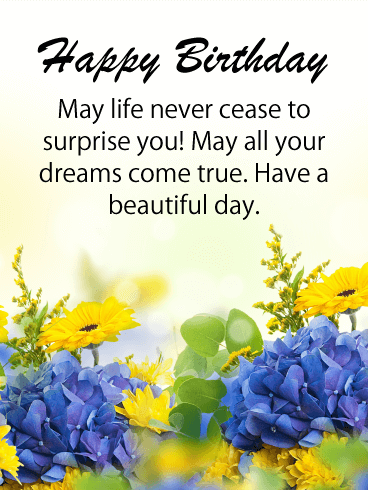 With this Happy Birthday card's message, you can wish her the best of days! Your sweetheart is as beautiful and delicate as a flower, but she also has a tremendous strength that she shows through all of life. 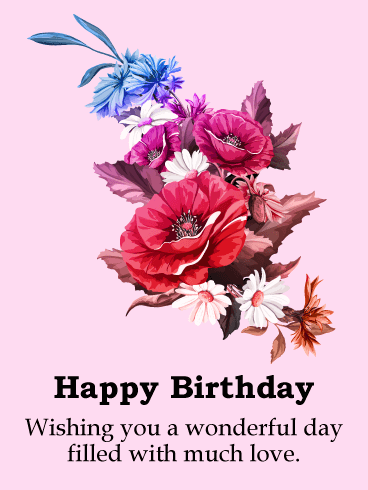 Birthdays are meant to show how much you love, appreciate, and adore the special people in your life, so use the lovely flowers on this Happy Birthday card to show how much you care. 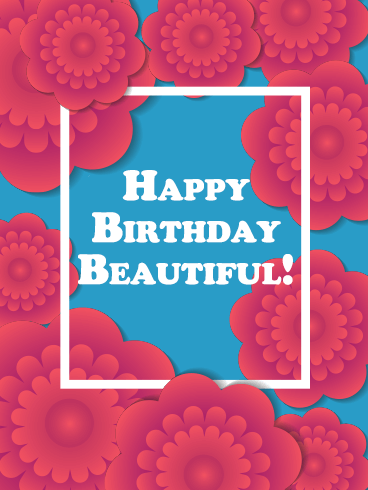 Your love deserves the best, so send her this Happy Birthday card today! Nothing is more beautiful than a flower...except your loved one, of course! Your loved one is gorgeous inside and out, so you need a gift that is everything she deserves. 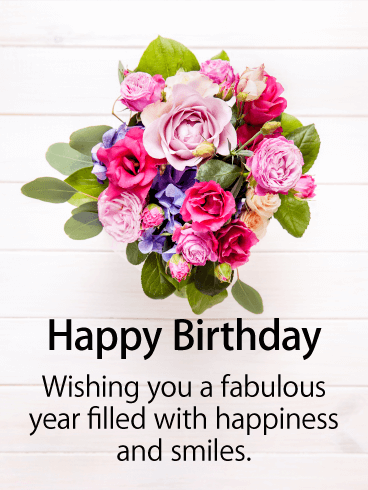 With this Happy Birthday card, you can show your friend or family member how excited you are to celebrate her birthday and how much you love her. 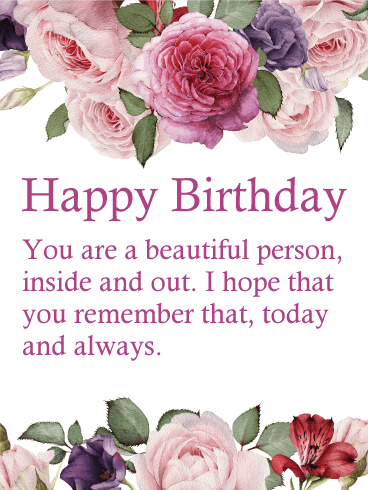 A beautiful person deserves a beautiful day, so send this birthday card to make this the best birthday ever! From the moment you met your sweetheart, you were blown away by her beauty. Even now, after so long, her beauty continues to capture your heart. 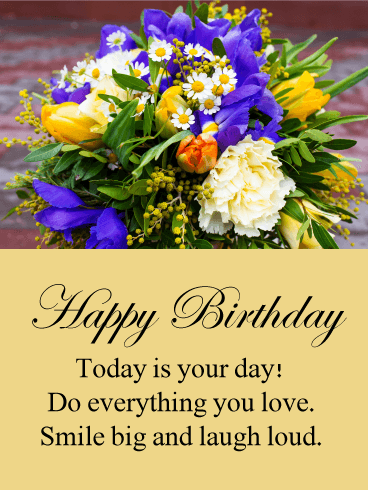 With this gorgeous floral Happy Birthday card, you can show your love how much you treasure her. Nothing can diminish her beauty or value in your eyes, so give her a birthday celebration that she will love! Flowers are a universal symbol of beauty and love, which makes this the perfect birthday card to send to your sweetheart on her birthday! 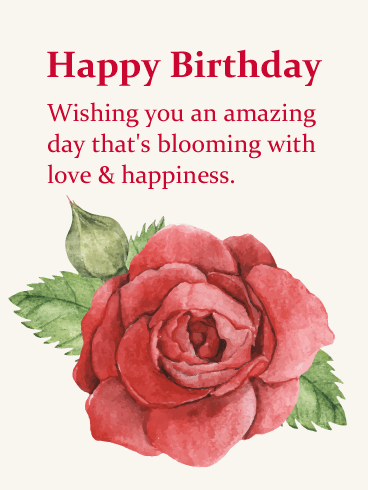 Like the red flowers on this Happy Birthday card, your loved one brings color and beauty to every room she enters. You love your birthday girl with all your heart, so use this Happy Birthday card to celebrate her on her special day! What is the best present to send to your sweetheart on her birthday? Some beautiful flowers, of course! 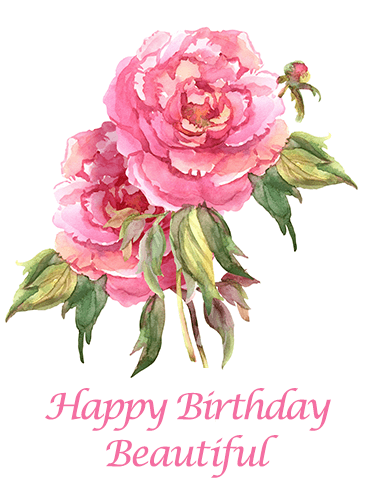 The beautiful pink peonies on this Happy Birthday card offer wishes of good fortune, love, and prosperity - the perfect gifts for such an incredible person on her special day! 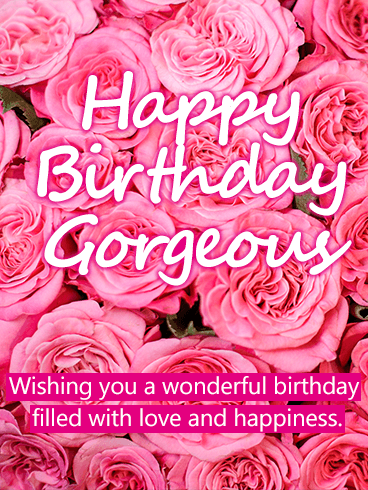 Your sweetheart's beauty is greater than any other person on earth, so let her know with this Happy Birthday card! The best birthday celebrations are bright, exciting, and gorgeous - just like your loved one! Some say beauty is in the eye of the beholder, but you know that every person in the world would find her gorgeous on the inside and the outside. 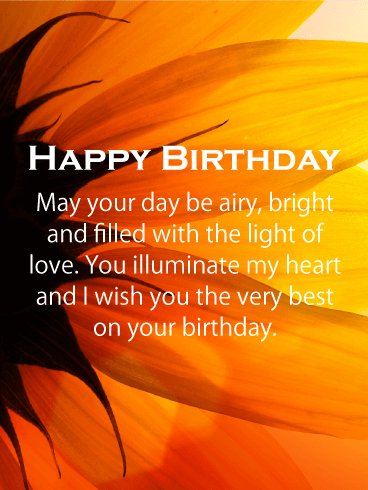 With this Happy Birthday card, you can show her how she lights up your life and how much you appreciate her! 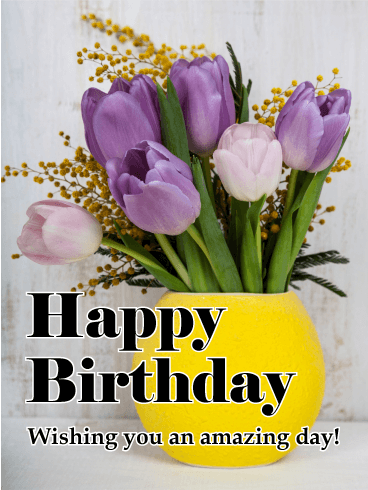 Make someone's special day a little brighter with this awesome tulip birthday card! The polka dot vase adds an element of fun and quirkiness, while the flowers are sure to brighten anyone's day. 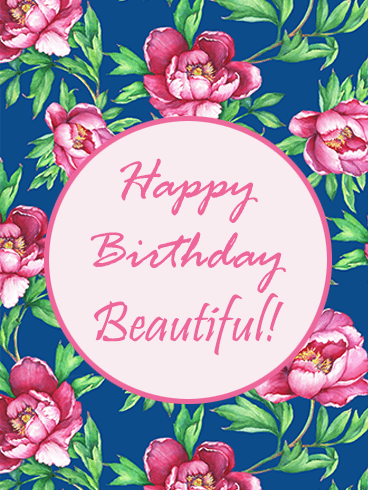 The colors on this birthday card are gorgeous, as are the wide array of flowers! This is the perfect choice for anyone in your life celebrating a birthday. Looking for the perfect birthday card to express your birthday wishes to someone you care about? Look no further than this gem! The floral arrangement on the top is simple but beautiful, with bright colors that add to the excitement of celebrating a birthday. Wishing the birthday boy or girl a fabulous year is sure to make them feel great on their big day! Flowers are never a bad idea, especially when celebrating someone's birthday. They just take things to the next level! 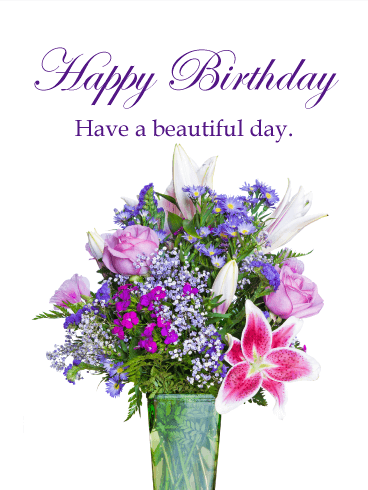 There are tons of birthday cards with flowers, but none with such a gorgeous flower pot and soft color scheme. 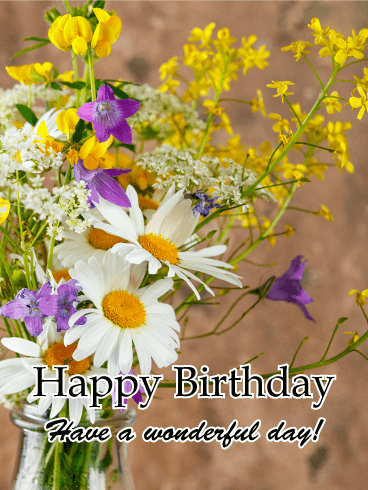 This birthday card is a great pick for anyone in your life celebrating a birthday, especially any gardeners or flower enthusiasts. If you don't quite feel like buying flowers for someone's birthday, this fabulous birthday card is a close second. The bouquet at the center is stunning, with gorgeous shades of pinks, purples, and creams. As if the flowers weren't enough of a statement, the sentiment of this birthday card is sweet. This birthday card is sure to bring a smile to anyone's face. 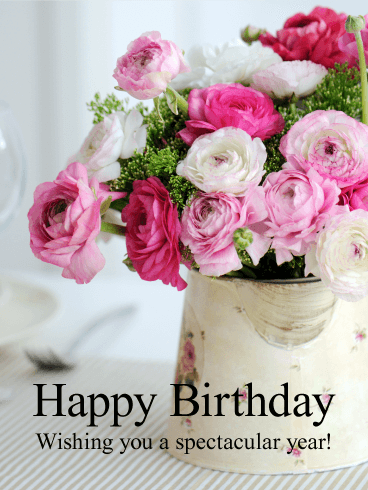 There's nothing like flowers to make the person in your life celebrating their birthday! Just look at those gorgeous flowers! 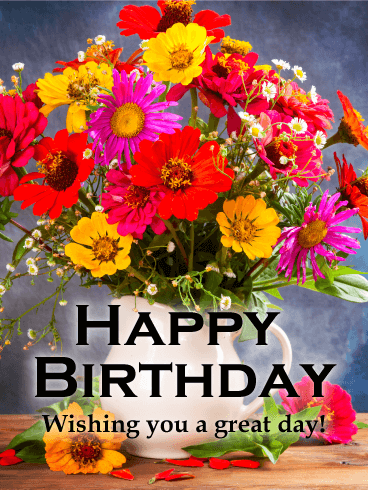 The bright colors of the flowers, vase, and background really make this birthday card something special. The sentiment is just so sweet! This is the perfect choice for anyone from a family member or close friend to a co-worker or neighbor. Let your partner know how much they mean to you this year with the gorgeous birthday card. Without her, your world would be dark and cold, a dull and barren place. She introduced color to your eyes, brought warmth to your soul. 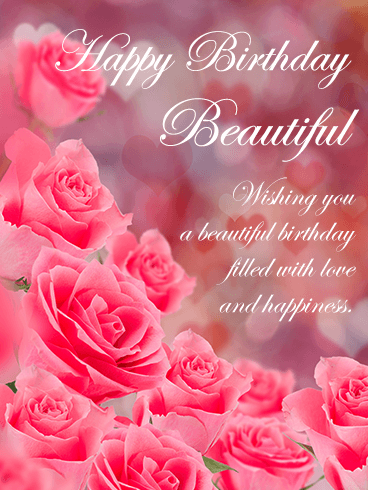 Just as she brings life to every bit of you, so you can bring life to her birthday by sending her this scenic card. 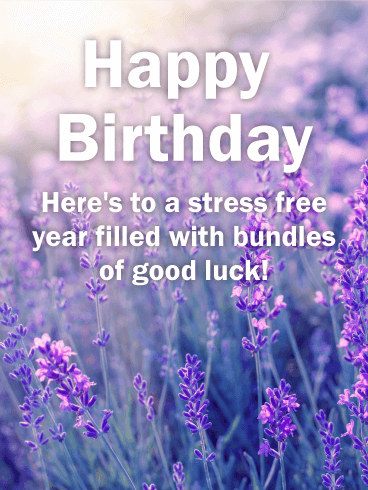 Send a gift of calmness for her birthday! Life can be hectic, but lavender is known for helping people relax. Birthdays are fun days, yes, but not everyone leads a life of adventure. Often, birthdays are the time to be pampered and sink into a state of calm. 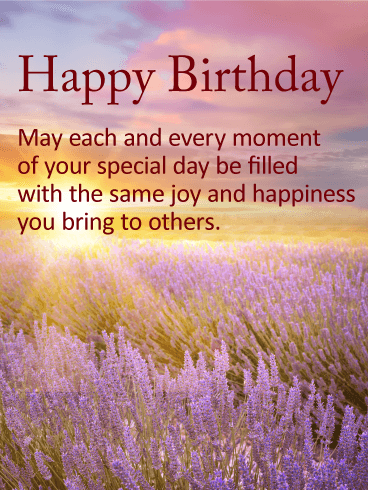 Evoke that sense of serenity with this beautiful birthday card and send it to a woman who needs it. As children, you were tossed outside and told to play. You sucked the nectar from honeysuckle, spotted the glow of buttercups under your chin, and wove daisy crowns to place on each other's heads. 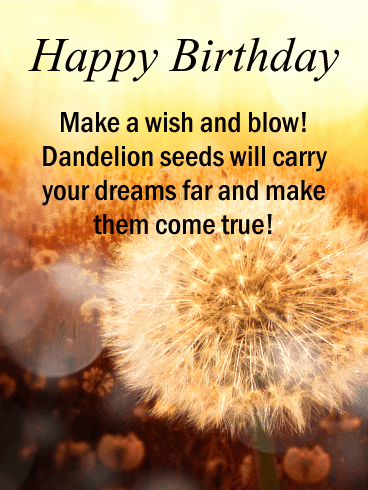 But a hard puff on a dandelion to scatter dream seeds was always better than blowing out candles. Send your wishes for her success and watch them spread and grow the entire day. Send her a card of love for her birthday! 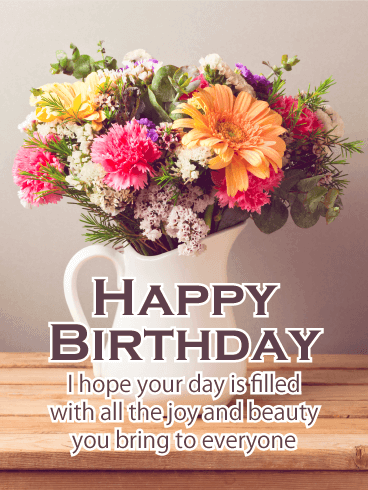 Just as flowers bloom with care and attention, so too will her happiness this birthday due to this message of your love. Shower her with beauty and sunshine and gift her support and love. Let her know how beautiful and special you find her and watch her face light up with joy!